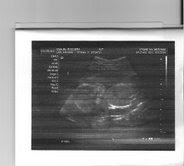 The Followell Family: My First Ultrasound! With both of my first two adoptions I never had the chance to be involved during the pregnancy. I am so excited that with this adoption we have the chance to be. H. was so awesome and brought me the ultrasound pictures of our baby. There were three, but this was the only one that you could really see her. Isn't her profile so dang cute? I love the shape of her little head and her cute little nose. I've always loved looking at everyone else's ultrasounds, but now I finally have one of my own. Aren't I so freaking lucky :)! Hi!! I am so so so excited to see this post on here!! I am so happy things are working out for the best. Good luck with everything. Tell my mom all about it when she is in Green River next week so she can fill me in. I am so jealous. I hope we have a birthmom like that someday. That is so awesome! I'm so excited you get to be apart of the whole experience! Congradulations! That is way exciting to get to be more apart of the process! congrats again even though I have told you before! :) and Im sure she is going to beautiful! that's so fun. i remember each picture you get is so exciting. love you guys! Wow! I am so happy for you! Congrats! You will love having another little girl. Wow! Miracles do happen! So exciting. Can I just say in the picture of you and H. you totally look like you could be sisters. We will all be looking forward to meeting this little one. yes the ultrasound really brings the experience right into reality...enjoy every moment...you guys are amazing! I am sooo excited for you guys. Babies are just the best. That's going to be one cute baby!